Gross non-performing assets (NPAs) of domestic banks jumped to 3.6 per cent at the end of March 2013 from 3.1 per cent of total lending a year earlier, according to RBI. Bad loans rose further to 4.2 per cent by the end of September 2013, latest data show. In October 2000, a consignment sent by a Lucknow-based gold jewellery exporter was rejected by a client in London. The jeweller had taken a loan from a state-run bank for the export. Following the rejection, he sought the bank's permission to sell the jewellery in the local market. The bank, unsure of the jeweller's ability to repay the loan, sought additional collateral to safeguard its exposure. The jeweller agreed and pledged some gold bars with the bank, but eventually defaulted on his loan repayment. The bank soon began making efforts to recover its money. More than 13 years on, the case has yet to reach a conclusion. So, what happened? In March 2001, the bank started valuing the gold the jeweller had kept as collateral. To its shock, the bank found that the pledged gold was actually copper alloy plated with the yellow metal. It lodged a criminal complaint against the jeweller and followed it up with a lawsuit in a debt recovery tribunal, a quasi-judicial body that helps banks get their money back. The case dragged on until June 2008 when the bank got the go-ahead to seize and auction the borrower's properties to recover its loan. But the story did not end there. The jeweller challenged the recovery proceedings in an appellate tribunal. He also filed a lawsuit saying the bank had misplaced his gold and sought more than five times the loan amount as compensation. The appellate authority dismissed the counterclaim in July 2011. Four months later, the borrower moved the high court seeking a rehearing of the case. The appellate body heard the appeal again and dismissed it. In February 2012, the borrower again approached the high court, but lost. In June of that year, the bank began auctioning the jeweller's properties. The auction was, however, put on hold by the State Consumer Disputes Redressal Commission. Though the commission had no jurisdiction on the case, the auction remained on hold even after the bank filed a review application. The jeweller's example is the rule rather than the exception when banks try to recover loans. "Almost 90 per cent defaulters challenge the recovery proceedings in courts," says R. Rudran, CEO of ARCIL Ltd, India's largest asset reconstruction company. Delays in disposal of cases by overburdened courts compound the banks' misery. Such cases highlight the difficulties banks face as they tackle their biggest challenge in recent years - a surge in bad debts. Loan defaults by companies that borrowed heavily in the past few years to expand their businesses are rising as the Indian economy crawls at its slowest pace in a decade and interest rates remain high. Gross non-performing assets (NPAs) of domestic banks jumped to 3.6 per cent at the end of March 2013 from 3.1 per cent of total lending a year earlier, according to the Reserve Bank of India (RBI). Bad loans rose further to 4.2 per cent by the end of September 2013, latest data show. State-run lenders, which dominate the banking system, are burdened with the major chunk of the soured debts. For instance, gross NPAs of State Bank of India, the largest lender, doubled to Rs 51,189 crore in the year through March 2013 from Rs 25,236 crore two years before. And asset quality is about to get worse. Bad loans could climb to 4.6 per cent by September this year and may even touch seven per cent of total advances by March 2015 in the worst scenario, the RBI warned in its half-yearly Financial Stability Report released in December. The central bank's fears are not unfounded. The data for corporate debt restructured by banks shows why. The amount of corporate loans recast by banks was Rs 2.72 trillion at the end of September 2013, up 19 per cent from Rs 2.29 trillion only two months before and 45 per cent higher than Rs 1.87 trillion a year earlier, according to latest data on the website of the Corporate Debt Restructuring Cell, a group of lenders that decides on loan recasts. In percentage terms, the restructured loans were six per cent of total advances as of September last year. This means that the proportion of stressed loans - gross NPAs plus restructured debts - jumped to 10.2 per cent of total advances as of September 2013 from 9.2 per cent six months before, according to the RBI's December report. The number of companies seeking to recast their loans surged after the global financial crisis of 2008/09. Restructuring is typically the first step banks take when borrowers appear unable to meet their repayment obligations. A recast involves extending the loan tenor and deferring interest payments. But, it doesn't help most of the time and such loans eventually become dud. A case in point is liquor baron Vijay Mallya's Kingfisher Airlines. In November 2010, the loss-making carrier's lenders recast loans of about Rs 6,000 crore by converting part of the debt into shares, extending the tenor and deferring interest payments by two years. But the carrier kept defaulting on payments to lenders, employees, vendors and tax authorities, and was finally grounded in October 2012. By early 2013, its lenders started categorising loans to Kingfisher as NPAs in their books. So, how are banks trying to come out of this crisis? And what is the RBI doing? Analysts say most banks, especially state-run lenders, have weak credit appraisal and management systems and are not capable of dealing with NPAs. They say most banks focus on acquiring new business rather than handling dud loans. M.S. Raghavan, Chairman and Managing Director, IDBI Bank, concurs. "There is no focused attention on NPA accounts [in most banks]," he says. IDBI is among the few banks that are getting proactive in going after soured debts. Last year, it asked regional, zonal and branch managers to focus on the top 20 NPA accounts in their jurisdictions. "The initiative has started showing results," says Raghavan. Banks also lack adequate mechanisms to spot early signs of deterioration in asset quality. 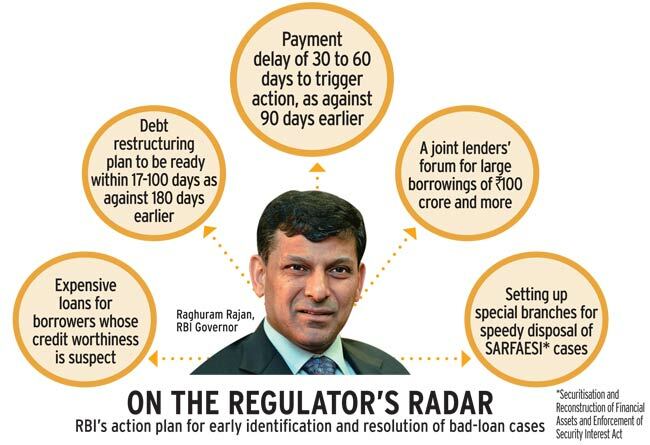 RBI Governor Raghuram Rajan is nudging banks to take a hard look at the initial stress in loans. The RBI released a discussion paper in December where it focused on early detection of financial stress. It suggested that if a loan is overdue by 30 days it should be classified as a 'special mention account'. Currently, a loan comes under the category of NPAs when the interest and principal amounts are overdue for 90 days. The discussion paper also suggested banks should set aside more money to cover bad loans. It recommended the provisioning requirement for unsecured loans overdue by up to a year should be increased to as much as 50 per cent from 15 to 25 per cent currently. Many banks are moving debt recovery tribunals and Lok Adalats under the SARFAESI Act to get their money back. The Securitisation and Reconstruction of Financial Assets and Enforcement of Security Interest Act, 2002, allows banks to auction properties of defaulters. But the tardy pace and the long-winding processes of the judicial system means banks recovered barely a fifth of the more than Rs 1 trillion that is stuck in courts. Banks are also increasingly writing off bad loans by making 100 per cent provision in their books. In fact, banks are often accused of using the write-off as a tool to lower their NPAs. Stuart Milne, CEO, HSBC India, says banks don't try to recover a loan after writing it off. Industry experts say banks should sell the written-off assets, as the sale proceeds go directly into their profit and loss account. 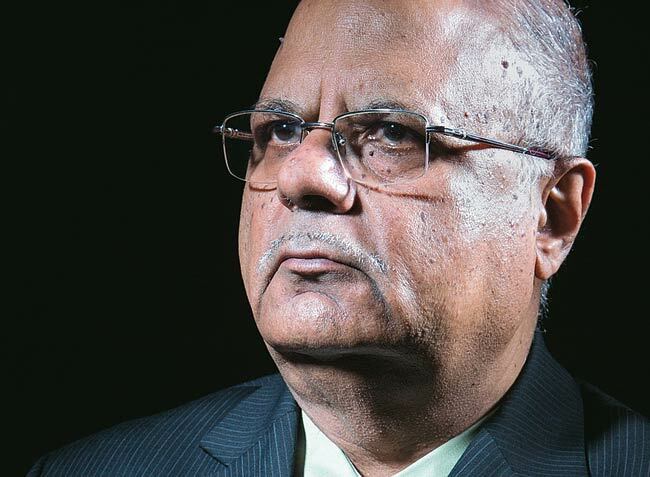 "We are willing to buy written-off assets, but there is not enough supply," says Birendra Kumar, MD and CEO of International Asset Reconstruction Company. The fastest way for banks to deal with NPAs is to sell them to asset reconstruction companies (ARCs), which have greater expertise in dealing with rogue borrowers. In the nine months through December 2013, banks auctioned bad loans totaling Rs 13,766 crore to ARCs. But, these auctions did not generate much interest because of a mismatch in the valuation of loans that banks want and that ARCs are willing to pay. "The success rate is less than 10 per cent," says Rudran of ARCIL. P.H. Ravikumar, Managing Director at Capri Global Capital, a non-banking finance company, says banks have higher expectations in the first year when bad loans do not require major provisioning and their book value is high. Raghavan of IDBI Bank says the concept has not picked up in India also because of the payment mode. ARCs initially provide security receipts to banks instead of paying in cash and pay the actual amount with some profit later when they realise money from bad loans. Executives at ARCs defend the practice, arguing that it takes them at least three years to resolve a bad-loan case. They also say that banks approach them when there is no hope of recovery. "This mindset has to change as we are better equipped to handle NPAs," says Rudran. "Not many [banks] recognise or appreciate the efforts that go into resolving a case." 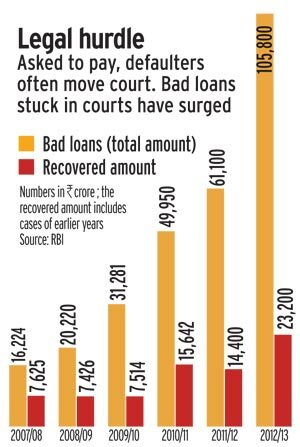 Selling bad loans to ARCs, writing them off or approaching courts against defaulters won't be enough, however, if banks do not simultaneously improve their lending practices. 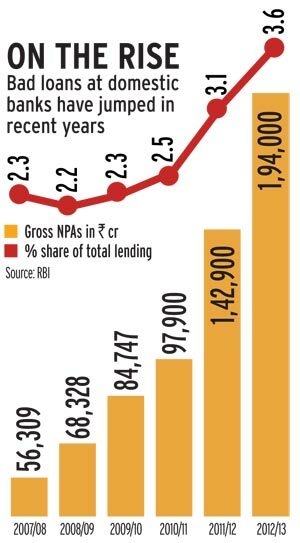 Rising NPA levels not just hurt banks' profits and share prices, they also hamper their ability to offer loans to borrowers who could actually use the money for useful purposes. RBI Governor Rajan is aware of the need for better banking practices. "We could wish for a more effective judicial process or a better bankruptcy system," he said recently. "But, while we await that, we have to improve the functioning of what we have."